A damselfly that tells fortunes…? I think this might be a small weevil(?) 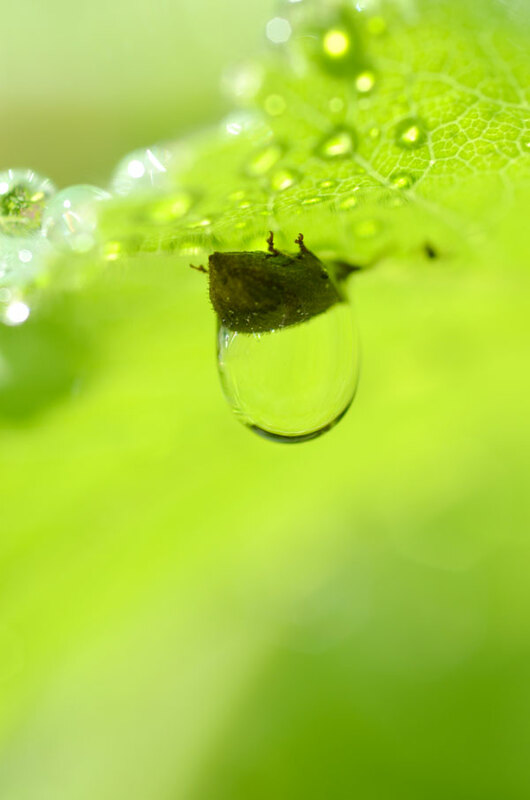 of some sort, managing to hang on to the underside of a leaf with the weight of all that water. We have had a fair share of grey and rain around here. 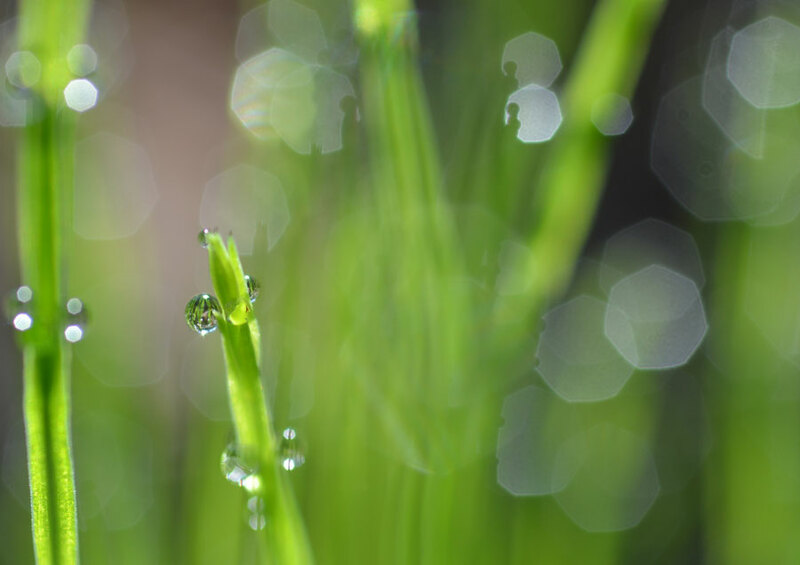 The earth is well watered, and you could disappear in the tall green grasses. It is easy to gripe about the greyness of it all, but when the sun returns you are reminded that each drop is a transient gem. Okay, WOW! 😉 Each image is so beautiful but I could especially stare at #6 all day. Karen – another set of stunning images! Thank you, Melinda. 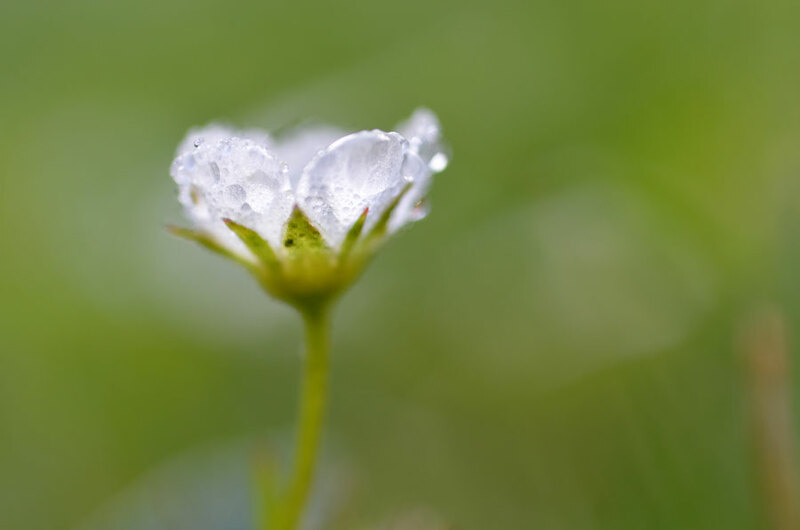 Chasing leftover raindrops…. Super Images .I love them. Thanks for sharing ,Karen. Karen, these are absolutely sumptuous images. Thanks, yet again, for sharing all this beauty. Oh, these are wonderful, Karen! Thank you, Anette. We are luck to live in a wonderful world. Bring on the rain, if this is what you capture because of it. Hi Graham, thank you. Equal parts sunshine in nice too! Ah, we all complain about the rain sometimes! Thanks for your comment, Laura. The bugs are back! It must be warming up. Love the way the world breaks into heavy chunks of prism close-up. Beautiful. It’s not too bad, here. A mix of sun and rain! Last year this time was so hot and dry by comparison, I don’t mind the weather now actually. Incredible and in the same time, Beautiful photos. Oh man, such cool photos. I need a macro lens! Oh yes, a macro lens is so much fun! Thanks for your comment Francine. Fantastic Karen! Very well done! Much appreciated, Phil, thank you! what a magical view. lovely. Unreal! I’ve never seen such beautiful macro photography. It’s something else! Oh gosh thanks. Seb. I’m glad you think so! Beautiful colors, delightful to the eye, especially here in the West right now. I love the orbs of the damselfly holding the green orb. Water in any shape or form can be so beautiful. Thanks, Karen. Isn’t that amazing how the damselfly was ‘holding’ the waterdrop! I was pretty thrilled when he moved into that position. There should be a ‘like’ button and a ‘love it’ button! There would certainly be a few of the latter for this post – striking colours and subject. The light dazzles are great and add real depth. Karen, These are magnificent. The first image is such a surprise — captivating along with your apt description. Thank you for this lovely post. 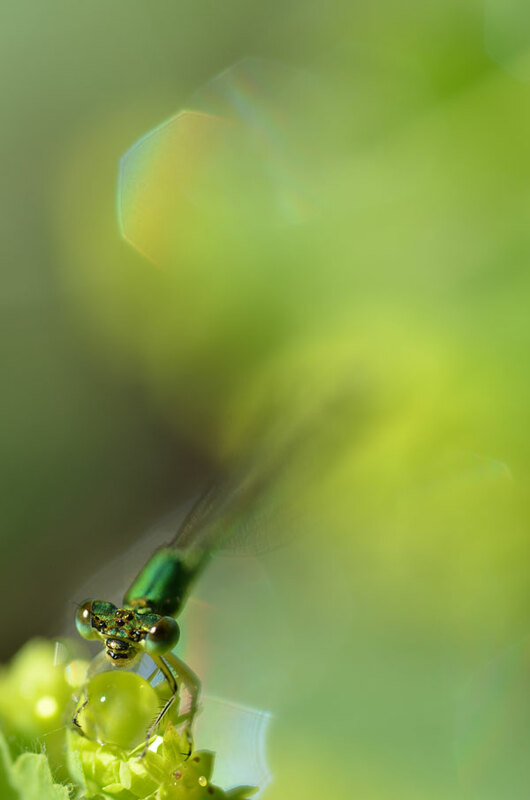 Hi Jane, I was pretty amazed when I noticed the damselfly was ‘holding’ a drop of water. I’m glad you like them, thank you! AH, Karen… this is the celebration of green and not only!!!! Thank you, Marina. The lushness of water and growth, I guess. Karen, you are always reminding us of the gems, whatever the season and always with the most spectacular surprises! Nature is endlessly surprising, isn’t it? So many tiny details to be seen. Thanks for your comment, Patti.
. . . we could use rain right now . . . Lest spring and summer we were in low level drought – the rainy spring is a relief in a way, although I’m not sure everyone would agree. Thanks for your comment, Emilio. Beautiful photos! This was a real treat. Thank you for sharing. Oh, such a lovely comment. thank you, Susan. Love the drama in all of these. They are such good captures of struggle and transition – it really heightens the sense of beauty. Thank you, Richard. Yes, those little insects really do work very hard! I was impressed by that weevil just hanging on to the little threads of the leaf like that. Amazing. You see beautiful minutiae in a unique and wonderful way. What a nice reprieve in the middle of my otherwise busy day… to stop and consider what small creatures are doing and struggling with. Thank you! Very fine photo’s; and great title. Thanks very much, Harrie. I’m happy you noticed the title. These are just so beautiful Karen. I could look at them over and over. And I like the symbolism of dragonflies = strength 🙂 Very well done. Yay, I’m happy you like them so much. Insects in general seem to have amazing strength (and ability) for their tiny size. 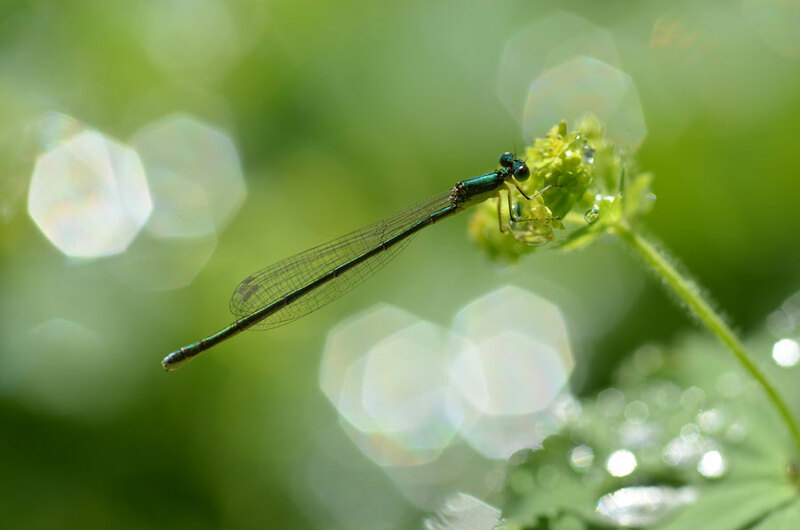 damselfly… dragonfly – how are they different? Sorry! Just looking at the post again and noticed the “damselfly” in your sentence. Dragonflies have chunkier bodies; when at rest, they hold their wings out like those of an airplane. Damselflies have slenderer bodies; when at rest, they keep their wings folded above and parallel to their bodies. You transfixed me. I could look at those ant ones for ages, but they’re all so gorgeous. I’m amazed at the amount of colour and detail you and your camera can capture! Really beautiful. Thank you, Trish. Transfixed – I like that! 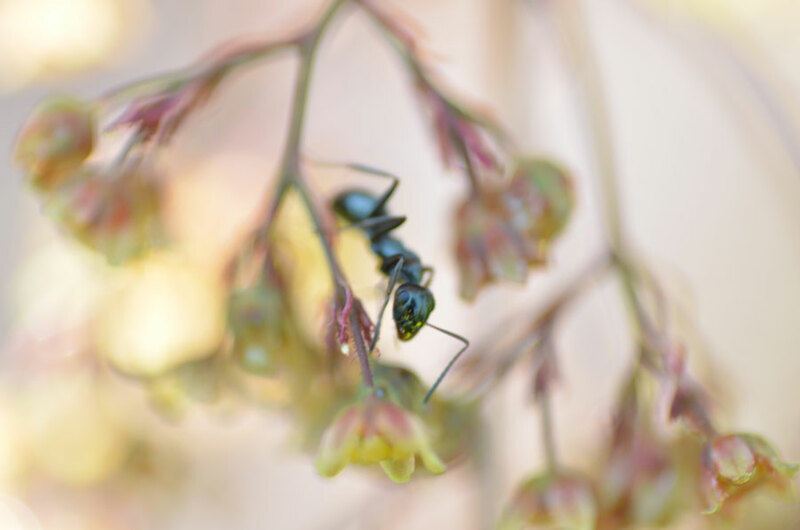 I particularly like the dreamy ant photographs – amazing work! Ah, thanks so much, Liz. They are so beautiful. Magical, Karen. Bente, thanks, I’m glad you like them. absolutely beautiful !!!! did the damsel tell you what she saw in her cristal ball ? You wrote: Each drop is a transient gem. It’s those fleeting moments that make life valuable. Yes, those moments that are gems, valuable indeed. I hope things are going well for you, Marcelo. Oh my, so new, so fresh, so you. This set made my day, Karen. An exquisite series! I adore the luminous green you captured in the first five. I admire your work greatly, but words are becoming inadequate to describe how stunning your photographs are. All I can do is look and look and look . . . . .
Hi Patricia, such a lovely comment. I’m happy you find my work so compelling, sincere thanks! Wow, Karen. Stunning, magical images. I’m completely drawn in to each one. I have a soft spot for tiny beings like the ones you’ve captured here. Such lovely color and light. Really wonderful! Hi Melanie, yes those tiny beings are endlessly intriguing. Thanks for your your nice comments. OMG! this is stunning! LOVE your work! So luminous and full of life. Beautiful and uplifting. Thank you Karen! magic.. that very special Karen magic.. does my heart good..
Just love those colours and bokeh to die for….. and again, that tantalizing focussing. Great series Karen. Hi David, thank you, I appreciate your lovely comment. Exquisite photos, Karen. They take my breath away. Such a nice thing to hear, Simon. Thank you! These were not done with just a camera – you must be in league with the earth gods. Can’t imagine how else you could have captured 1,3,5 – especially 3, the weevil. And that green – must have come from same earth gods. And I could cover my house with 2. I’m glad you do, thank you! I think the dark insect with the drop hanging from it might be a planthopper or leafhopper rather than a weevil. You might be right, it was in an awkward place to get a full picture but it sort of appeared to have that odd weevil type ‘snout’. 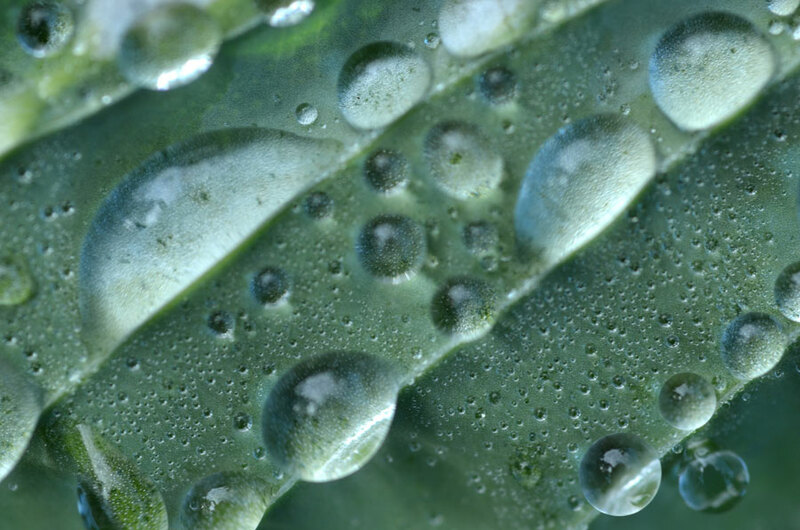 I Love macro work – it’s like a whole new world! Yes, it is another world up close, isn’t it?! Absolutely exquisite…definitely some of the best photos I have ever seen! Makes me wish I knew how to use a camera properly!! Absolutely fascinating and portrayed in such a luminous fashion. This is like space-age modern-art applied to nature. How beautifully and tenderly shown. Thank you, Steven. Space-age – I hadn’t considered that but I know what you mean, I think. Such beauty and simpicity. Thank you for sharing these amazing images. I’m happy you enjoy them, Lydiya. Thanks for your comment. These are glorious Karen! So jewel-like and full of light. minimalism at its best, wonderful shots, Karen! Much thanks for you comment, Jesus. That is from a beautiful poem, Steve. Thank you. 95 comments ahead of me, I wonder if you’ll ever… oh heck: Karen, these photos are ridiculously beautiful! I’m spellbound, lighthearted, and awed, awed like I was inside The Secret Garden… You are such a talent! Thanks for the escape, Karen. Thanks sincerely for your most lovely comment, Anette. I really love the colors and the short depth of field in your images! 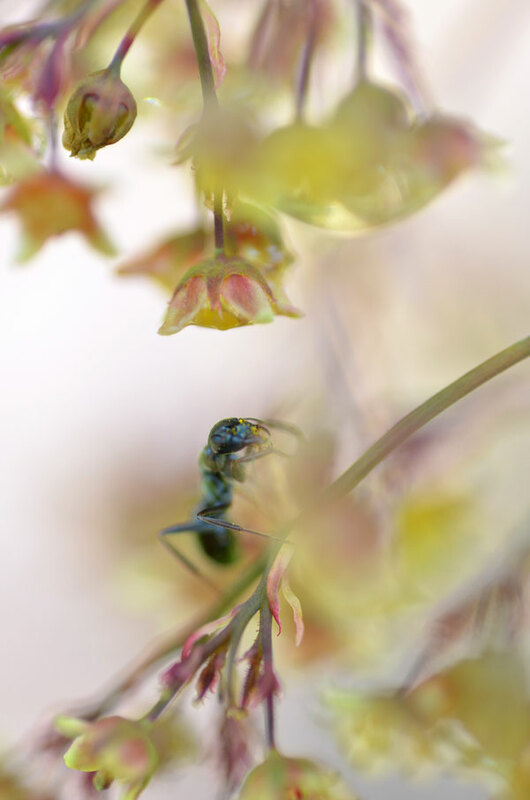 I absolutely LOVE the vertically-oriented ant-and-flower photo. The delicacy of the pinks and greens, and the fluctuating focus imbue it with a sense of magic for me. these close up shots are so great and interesting.